Continuous explosion proof exhaust ventilation system (600 cfm) vented outdoors meeting NFPA 30 with fail-safe alarm. Explosion relief construction (215 psf blast rating) meeting NFPA 30/68. UL labeled swing type fire doors with interior panic hardware & auto closer. FM Approved spill containment sump with emergency overflow drain. Class 1, Division 1 explosion proof lights, wiring, controls, and switches. 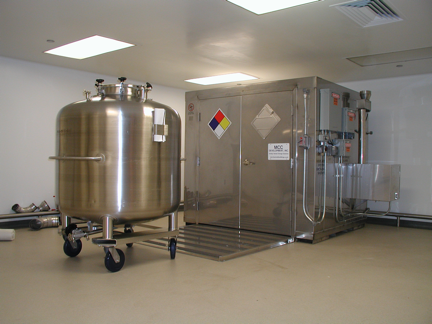 Modular design allows for future expansion and relocatability. Explosion relief venting for “damage-limiting-construction” per FM Std.1-44. UL listed automatic dry chemical fire detection and suppression system. Continuous exhaust ventilation system meeting NFPA 30 with fail-safe alarm. Explosion proof electric heating system to ensure product stability. 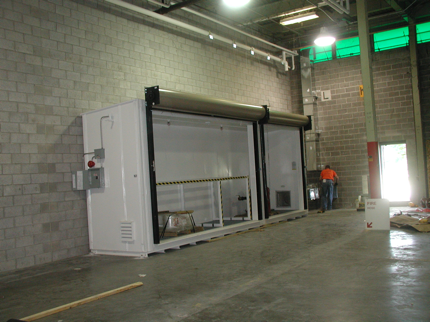 Overhead rolling fire doors (front & back) for ease of material access. Gravity roller conveyors to facilitate drum movement for dispensing operation. UL listed automatic AFFF foam fire detection and suppression system. 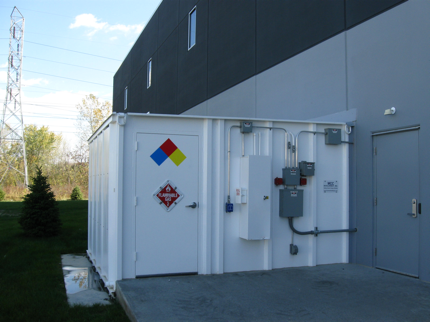 Continuous explosion proof exhaust ventilation system (900 cfm) vented outdoors meeting NFPA 30 with fail-safe alarm. Custom tubular steel racks for two tier storage of 250 gallon totes. 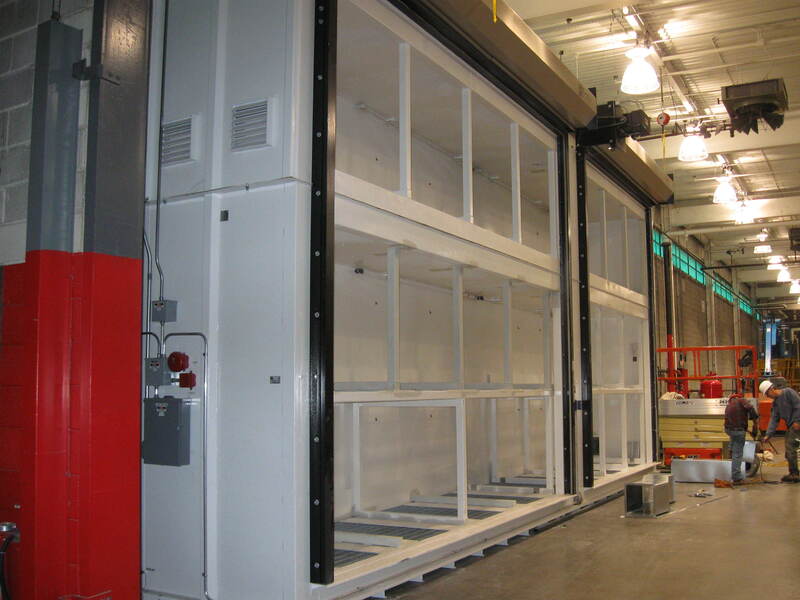 UL labeled overhead rolling fire doors for ease of material access. Class 1, Division 2 explosion proof lights, wiring, controls, and switches. 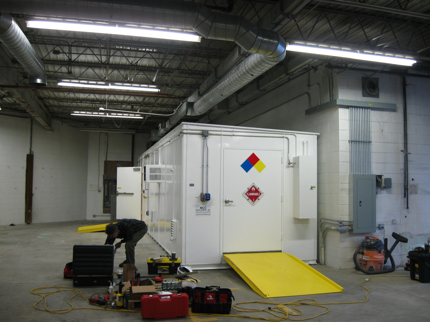 MCC Development engaged to design, fabricate, install and commission this FM Global Approved 14’ x 30’ hazardous waste storage and process room (H-2/H-3) with four-hour fire rated walls, built-in secondary spill containment, 3-drum walk-in fume hood, continuously-running duel exhaust ventilation system with fail-safe flammable vapor detection system – in lieu of explosion venting – and automatic dry chemical fire suppression system. Automatic dry chemical fire detection and suppression system. Continuous exhaust ventilation system with fail-safe alarm. Explosion proof air conditioning for climate control and product stability. 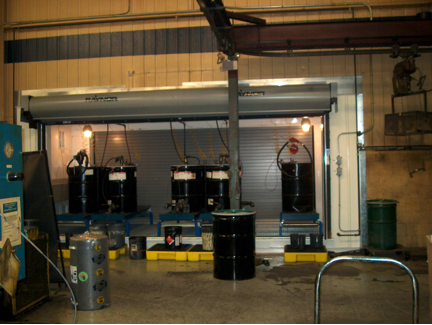 Spill collection pit with explosion proof audible and visual alarm. Class 1, Division 1 HVAC, lights, wiring, conduit, controls, and devices.